The availability and easy access of renewable energy make biofuel as an attractive option for the transition, away from the fossil fuel. Ethanol produced by the fermentation process is so far the dominant biofuel, and production of bioethanol at cost-effective method is the ongoing challenge. Since bioethanol production involves highly diluted fermentation process, apart from fermentation, separation and purification of ethanol is the heart of biorefinery process. The majority of the energy requirement is involved in the separation and purification of ethanol from the other species present in the fermentation broth. So far, energy-intensive distillation process followed by adsorption is the conventional method for the separation and purification of bioethanol. The membrane technology offers an alternative that requires less energy during ethanol separation. 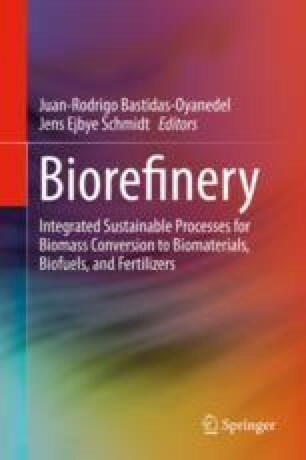 In this chapter, we briefly discuss the background of the ethanol biorefinery process in order to understand the separation process. The membrane preparation process is discussed in detail. The separation and purification of bioethanol using membrane involve two different kinds of membrane materials, namely, organophilic membranes for the ethanol enrichment from the fermentation broth and hydrophilic membranes for the dehydration of the enriched ethanol into fuel grade ethanol. Selective literature reports are cited, and finally, the summary and some perspective for the future direction of membrane technology for the ethanol-water separation are given.